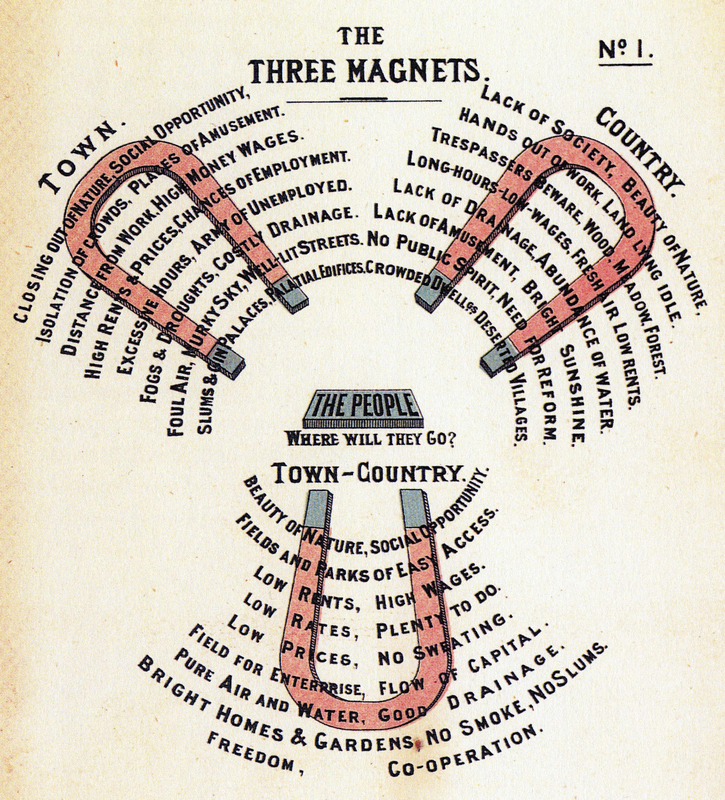 Suburban lifestyle is sometimes traced back to Sir Ebenezer Howard’s vision of the “garden city” in the late 19th century. It was a response to the recent emergence of the polluted industrialised city, with its factories, their gigantic furnaces, and swathes of working-class tenements. His aim was to integrate the best of what the town and the country had to offer, while eliminating the ills of both. With mathematical precision, he calculated an ideal demographic for geometric habitats that were manicured and symmetrical. One can say that the era of industrialisation struggled with different concepts of what the new city would become and Howard’s Garden city was a strong contender as it resolved polarities and imagined a romance between city and nature. Howard’s Garden city resolved polarities and imagined a romance between city and nature. He is said to have influenced planners such as Patrick Geddes in his plan for Tel Aviv's Old North. There are several neighbourhoods inspired by the Howard's garden city concept that would come as a complete surprise. Jackson Heights in Queens for example, or working-class neighbourhoods in Prague. The reason for this is that his vision for the garden city was primarily geared towards creating an alternative housing for working classes. At the core of his project was the very antithesis of middle-class suburbia, which he paradoxically went on to inspire more than any other urban planner. Typically, the suburban (mis-)interpretation of the garden city plucked elements selectively from his blend of the most favoured aspects of town and country life. It then located it within the nuclear-family, privately owned, middle-class aspirational ideal. Such selective cross-planting bloomed into the mass-manufactured suburban homes one associates with post-war American suburban housing. Basically, miles and miles of identical private homes with patches of gardens. These middle-class neighbourhoods promised the best of the country — greenery, space, clean air and community — with the best of the city — modern comfort, law and order and jobs within driving distance. As we know now, these speculatively financed suburbs have proved to be some of the worst urban dystopias of our times: symbolising real estate bubbles, endless traffic jams, environmental devastation, impossibly expensive infrastructure, racial and social exclusion, and atomised living conditions. Speculatively financed suburbs have proved to be some of the worst urban dystopias of our times. In India, the planning of Lutyens’ Delhi was partly inspired by the garden city ideal and was propped up almost exclusively by governmental investment. It is today synonymous with wealth and exclusion. The label of the garden city was used in a different context for Bengaluru, which married it to a suburban aspiration for its middle-classes. It became linked to an indigenous ideal that was rooted in the city’s love for gardens and lakes planned in a way that did not directly owe to Howard’s conception — but emulated it in spirit. Suburban living is an ideal also for the Indian middle-class, which often seeks to acquire private land to build a house with a garden in proximity to a centre of activity. Cities like Chennai and Bengaluru have many folds and creases in which such suburban living co-exists within a generally chaotic and dense urban fabric. Second and third-tier cities are following this trajectory as agricultural land is rapidly converted into residential suburbs. The Indian working class, which cannot afford a plot of land near the city, has found other ways of getting the best of the town and the country. The Indian working and service class, which cannot afford a plot of land near the city, has found other ways of getting the best of the town and the country. What seems to have emerged is a floating “sup" urban ideal where people live between the country and the city. Here the non-nuclear, “joint” Indian family often occupies both, a small space in the city giving access to professional and educational opportunities, and a much bigger space in the village giving access to nature, space and a large family home. Thanks to the vast railway and road networks connecting thousands of villages to centres of activity, it is possible to get the best of both worlds, provided one takes long journeys in between the two. This is a pragmatic way of fulfilling Howard’s utopian vision. It also shows that perhaps more than peri-urban sprawl, it is mobility that is at the heart of our urban lives in the 21st century. This article was first published in The Hindu Sunday Magazine on September 29th, 2018. 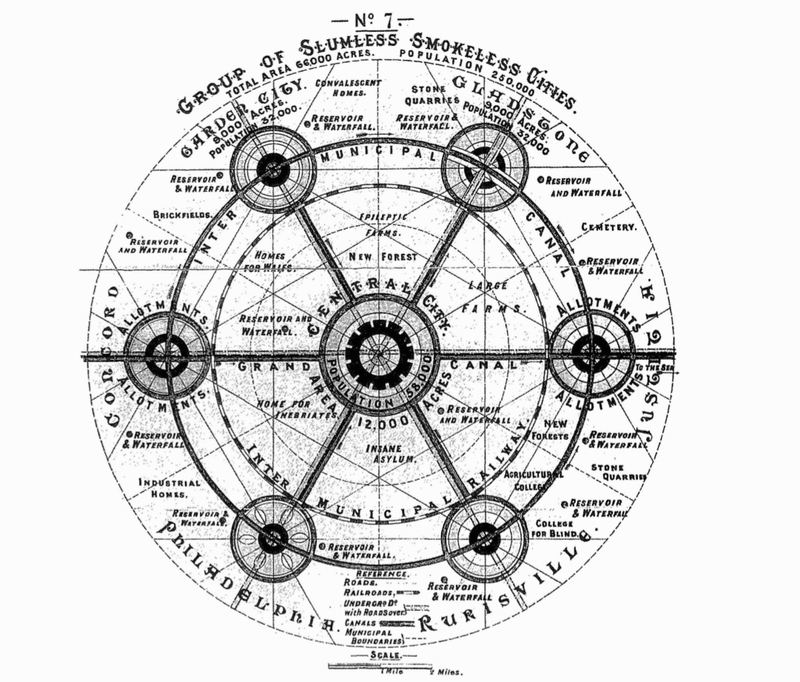 Up and down, Sir Ebenezer Howard’s diagrams of the “garden city”. Top - remix of his diagram by urbz.